Q. 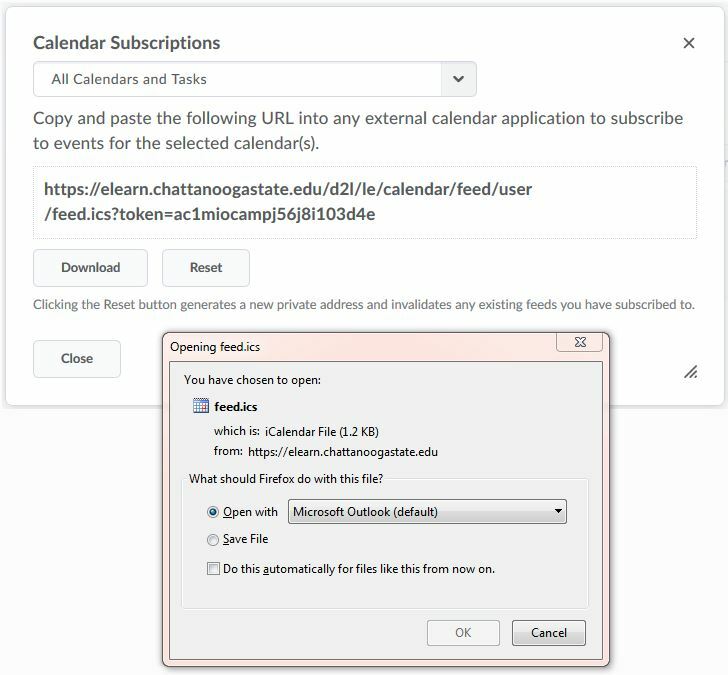 How can I add my eLearn calendar to Outlook? It's usually an easy process to add an eLearn calendar to your Microsoft Outlook calendar. Do this on the computer that has Outlook. Log into eLearn and go to your course. Go to the Calendar (in the Tools tab) and click on Settings. Click to check the box for Enable Calendar Feeds, then click Save. Next to Settings you should now see a button for Subscribe. Click Subscribe and you'll get a box with the URL (web address) for the calendar, like the one below. Now click Download, and in the pop-up box select Open with... Microsoft Outlook. Click OK, and Outlook should open and automatically add the calendar. If this doesn't work or if you want to add your eLearn calendar to a different calendar program, you can copy the URL, then add it manually to your calendar app, usually through File > Account Settings. Double-check the calendar in eLearn periodically to be sure Outlook (or your other calendar program) is updating with new events.